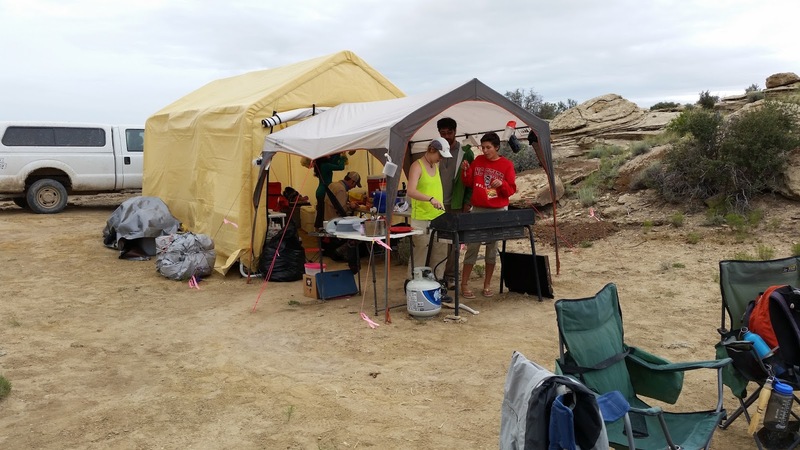 I spent the first few weeks managing a sauropod quarry in the Morrison Formation. 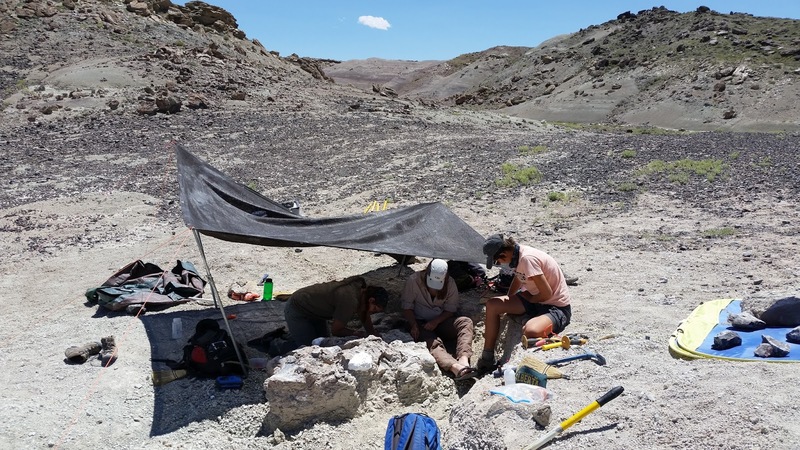 Although the Jurassic is not the main focus of our lab’s research projects, its a nice addition to the museum’s collection, and if I recall correctly this is some of the most western outcrop of Morrison. 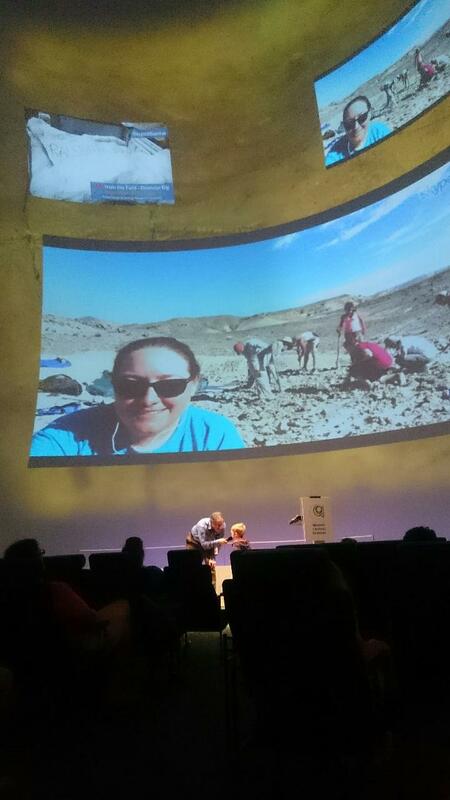 I was usually joined by an enthusiastic set of students from NCSU’s palaeontology field school taught by Lindsay Zanno. Thanks for being cool, students! And thanks for introducing me to Welcome to Night Vale, which is basically the best possible podcast to listen to while digging up a dinosaur in the desert where the sun is hot, the moon is beautiful, and mysterious lights pass overhead while we all pretend to sleep. 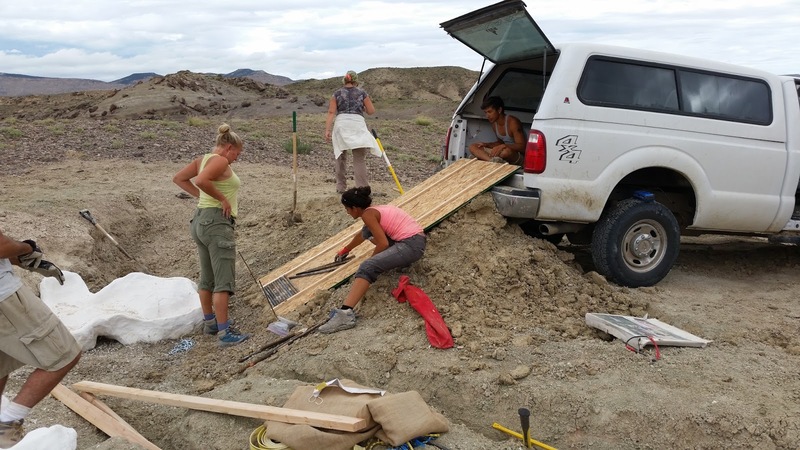 Most of our sites were within walking distance of camp, but it was a bumpy drive out to the sauropod quarry and back each day! 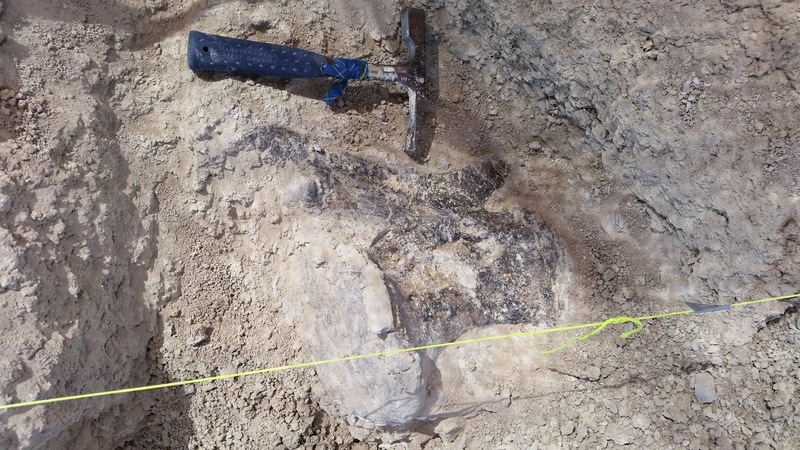 Here’s what some of the block of diplodocid looked like early on – pretty hard to interpret! And here’s how it looked a little while later! 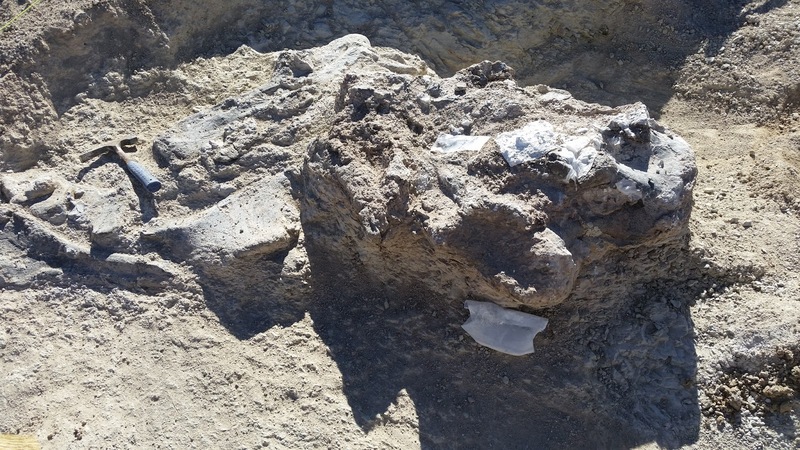 Still hard to interpret, but this is probably part of the pelvis, and some sacral and caudal vertebrae. Last year a large block of articulated caudal vertebrae was taken out of the quarry from the area to the right in this picture. Just when I thought we were mostly finished, I found this nice ‘little’ caudal vertebra from probably about the midpoint in the series. 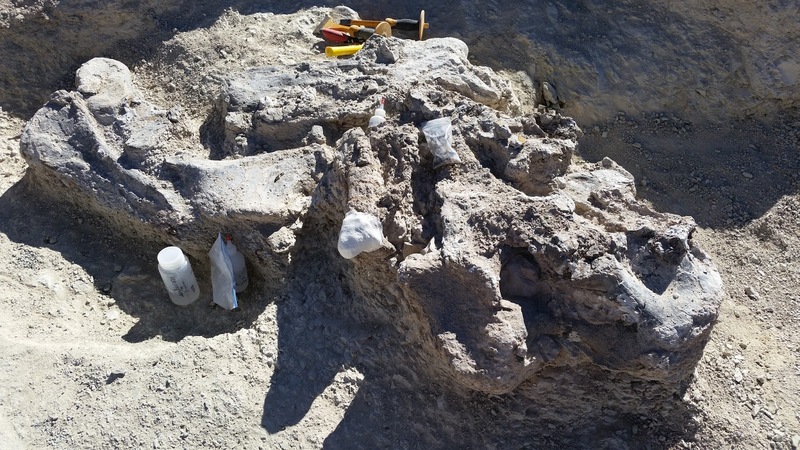 Sauropod bones make for some pretty big blocks to collect. Here’s Lindsay and the crew getting ready to plaster the top of this block, by stabilizing holes and cracks with some good old fashioned bentonite mud. This was a new and interesting technique for me – building a ramp to move heavy specimens into the truck! We used dirt from the quarry to build a dirt ramp, then nailed some 1x2s to a piece of heavy duty plywood and set some iron rollers in the middle. Using a winch and some pry bars, we were able to roll the blocks up into the truck. A good method! We also did some live presentations with the North Carolina Museum of Natural Sciences from this quarry! Here’s out little shrine to cellphones – a fortuitous spot with good reception. We rigged up a holder for the phone so that we could Skype with the museum into the Daily Planet theatre. We talked a bit about what we were doing, and the audience could ask us questions! 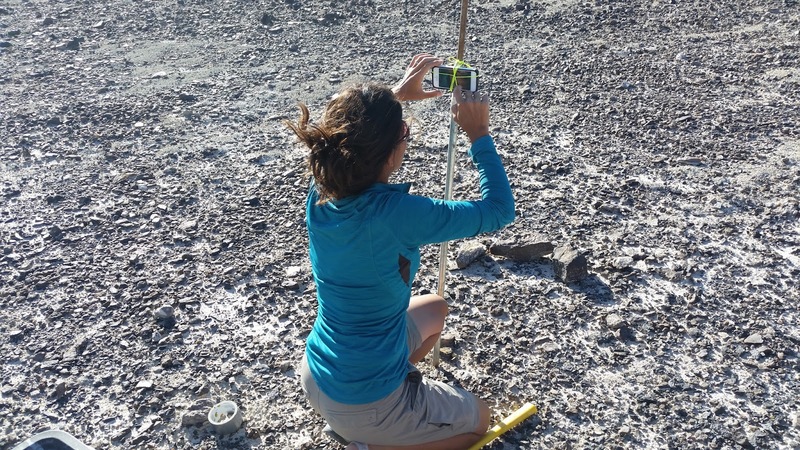 I think about how much I would have loved to be able to talk to a palaeontologist at an actual dinosaur dig when I was little, and I’m continually amazed by what we’re able to do with high tech gear and a little bit of ingenuity these days. 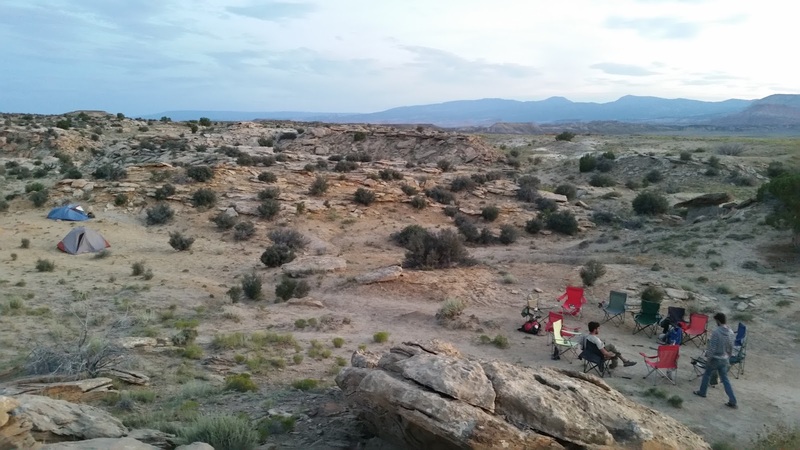 Next time: Cedar Mountain Formation shenanigans!